1) Complete and timely patient interventions. 2) Complete and timely patient billing. Physician verification of verbal or telephone orders. Physician orders that need to be acknowledged. Physician orders which have been acknowledged but need to be completed. All session related medications required to be administered prior to closing dialysis session. Medication orders which need to be reviewed. The “next review” frequency is user definable. 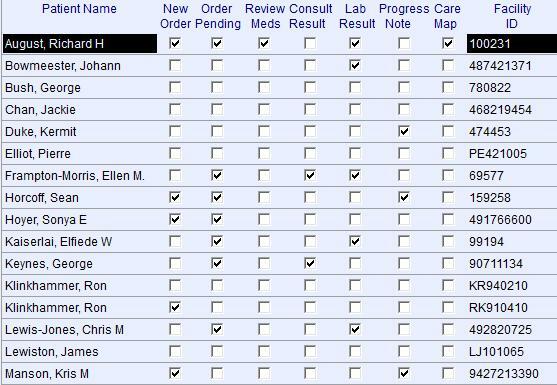 Medication order completeness is required when creating a new medication order: mandatory field include, physician, dosage, frequency, route. Medication order comments are required when creating a session related medication, a medication with a frequency of one, or an EPO medication order dosage which is greater than 10,000 units. On all medication ordering displays, the cyberREN user is alerted of patient allergies to medications. Further alerts are listed below. The Patient List, cyberREN's central display, presents all patient alerts in a concentrated format. In the sample to the right, alerts are shown as a check mark, which when clicked will show the alert in detail. It is the general task of the caregiver staff, to keep all cyberREN alerts clear. New lab results which have entered the system. All lab results which are out of range, or which are changing too quickly. The range can be specific to a lab element or specific to a patient and is user definable. Requisitions to be completed / patient samples to be drawn. For a complete list of cyberREN alerts & expectations, contact Cybernius Medical Sales or CML Technical Support.